Auckland Transport’s board meet again today and I’ve combed the reports to find what I think are the most interesting bits of information. The closed session is usually where most of the interesting items reside but this time there doesn’t seem to much too report with most items appearing to be fairly technical issues like procurement strategies and bylaws etc. Perhaps the most interesting item would be a project update from the NZTA – I wonder how much the delay to the opening of Waterview will be discussed. As usual the business report provides a lot of content. This is generally in the order it appears in the report. Under the heading of Organisational Development, one of the items covers the issue of diversity in the organisation. AT is certainly an organisation that could do with some more diversity in it’s ranks. The AT HOP Web Rebuild project has hit a number of significant technical issues with the data streams (APIs) and the operational use of that data. These issues have surfaced during our testing phase of the project. The project team are working with Thales to identify the issues and progress is being made. This project covers the rebuild of the Customer Web Portal and the Customer Contact Centre Web Portal, as well as Online Card Sales functionality and will deliver a better online experience for our AT HOP customers. The gates for Otahuhu arrive next month and will be installed by the end of June. Manurewa, Papatoetoe, Henderson and Parnell stations are due to be gated in Q3 this year while Middlemore is being reviewed and designs developed for Glen Innes and Papakura. 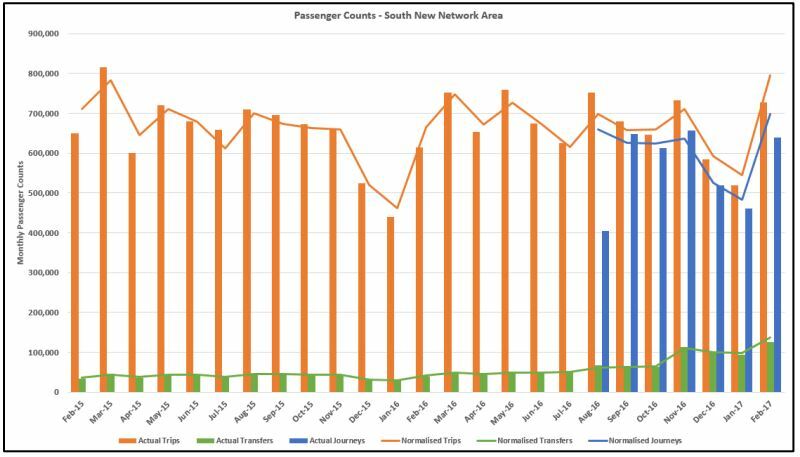 The latest numbers for the South Auckland New Network continuing to grow and there were 130k (28%) more trips this February than Feb 2016. Passenger trips have increased by +130,000 (+28%), the highest numerical and percentage growth on record since the completion of HOP implementation. Network wide (excluding SkyBus and ferry) the increase was +630,000 (+10%). Transfers have increased by +96,000 (+232%), the third consecutive month with transfer growth above +65,000 and +200%. Network wide +356,000 (+60%). Passenger trips less transfers (to give an indication in the growth of journeys as journey growth is unavailable until August 2017) have increased by +34,000 (+5%), the highest growth on record since the implementation of HOP. Network wide +278,000 (+4.8%). The report contains some more up to date information on when the New Network will be rolled out. We already knew about West Auckland but the others had previously been more vague. There really should be a minimum time for bus lanes of 7am-10am and 3pm-7pm to allow the peaks to operate. I certainly hope AT aren’t looking to replicate anything like the Mt Eden bus lanes which only operate for a short period in the afternoon. Late last year AT launched a unique park & ride trial at the Harbourside Church on Esmonde Rd. The carpark is actually run by Wilsons but AT are doing some of the promotion for it. A section of the report higlights the results so far. There was light customer uptake in December. A small ‘street marketing’ promotion commenced in early February to increase usage. The site is now seeing regular daily parking of up to 14 vehicles. Further growth is anticipated during March as a result of ongoing promotion (local flyer drops to residences and businesses, street marketing) and increased traffic congestion (typical of March – May as students return to tertiary study). Great to see those RTN biz cases progressing. Also good to get a date for the Central new network. Almost the end of the year, but it means, for us, the difference between having a near uselessly slow and meandering bus, the current 020, and a rational and direct one; yay! Jeff, great news; it’s doing the logical thing and turning right into Ponsonby Rd from Richmond, then K, Pitt, city…. Only disappointment is that its still 20min freq., but it will surely pick up riders once it takes this much improved route. I may even leave the bike at home when it rains once there’s this option…. A year long business case just to protect a route? WTF. And why do AT get away with delivering everything years late? Where are these new bus lanes? Why is the new network so late? Why haven’t they changed bus lane hours? If I was the CEO then heads would be rolling. It just seems to be accepted that very simple things will take years. They can probably build the CRL quicker than they can decide on bus lane hours. The way that is written implies they may reduce hours to accomodate parking at different times?? Sound ominous. Wilsons, and Park ‘n Ride? Recipe for disaster and extortion. End result typically would be cheaper to drive. I wonder if one of the issues with this park and ride is its location. 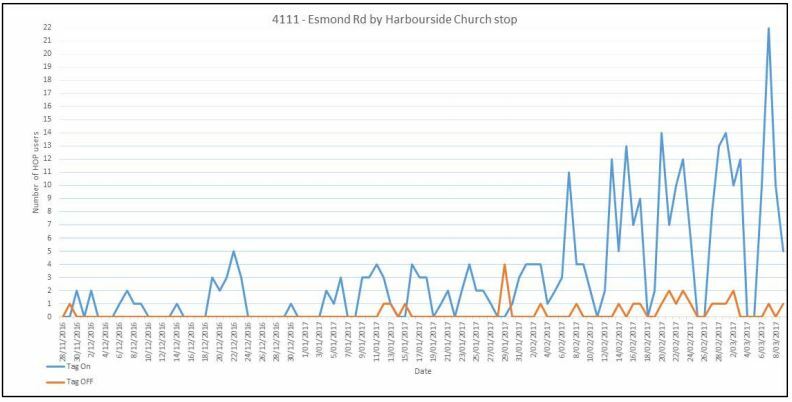 The congestion in the morning occurs on Esmonde Rd, not the motorway, and the church is halfway along Esmonde Rd. So using the park and ride only avoids some of the traffic – you still have to sit in a queue to get there. By the time you’re there you may as well just wait another few minutes and get onto the motorway. Agree this Park and Ride is in a very poor location. Heavy traffic on Esmonde Rd extends back onto Lake Rd in the morning peak. North Shore buses funnel through this stretch of Esmonde Rd as well and get caught up in same general traffic prior to where the bus lane begins. So by encouraging using the park and ride here, drivers are contributing to the delay of the buses they are wanting to catch! That’s exactly right – everything about this Park n Ride is wrong (including the location). hmmm that’s a pity too far along the road, so I guess if you were going to the CBD or similar, the only saving would be a bit of parking $ saving, and sometimes a time saving. $1 + 2 zone fare, $3.15 vs more car running expenses & say $15-24 parking in the city, still would be worth it depending what you are doing. The minimum city early bird rate now seems to start at $25. To pay $1 for parking on Esmonde is a no brainer if you can’t find free parking before this point. Re SH16. Its interesting to note that after spending hundreds of millions upgrading it and now having the most premium 4 lane, barrier equipped, electronic sign controlled motorway in NZ from Newton Rd west bound, no expense spared, NZTA have seen fit to in essence re-designate what was a motorway to an expressway by reducing it from the old 100 km/hr to a maximum speed of 80 km/hr from Newton Rd west. It is honestly farcical doing that speed on that motorway. Why was there such a huge spend up again NZTA and why have you “Nanny State” bureaucrats done this? Bus lanes need to be from 0600 to probably 1000 hours because of the spread of morning peak. 1600 to 1830 would suffice for most evening runs. I do not think there needs to be total bus lanes 24/7 however. Symonds St remains an enigma to navigate in a car. Why is the government putting its oar into the rail operators tendering process? Is this the quid pro quo of having them contribute to the CRL? I want this to be controlled by AT 100% and nothing to do with Wellington. Hate to think who donates to who and wins a contract if this government has anything to do with it. And it may take away AT’s ability to set the agenda for tendering. And for any motorist who sees the brand “Wilsons” on a car park you just know you are in to have your bank account drained especially if you are a minute late. They are not a company I want to deal with. I suggest this may be a contributing factor to that Park and Rides low take up. That and paying a fee. The changes to the NW motorway speed limits are an absolute shitshow; has any part of this actually been a success? With this expressway change and the unspecified length of delay on the tunnel opening whole West Ring Route project is becoming a farce. We all know that when a project go live date gets pushed out during the testing and commissioning phase its due to failures and shortcoming found during that phase that require remedial work so it’s time someone comes clean about the faults they have found. There has already been work to replace faulty concrete and we also know about dodgy Chinese steel being used in other NZTA projects so just what has gone wrong here? Time for someone to front up with some facts not just spin. The failure to build a busway with the widening here affects the practical operation of the motorway beyond the obvious one of reducing traffic demand. Separating Transit operations from the motorway is obviously going to simplify operating the motorway as well as profoundly improve Transit quality and demand… This aspect of SH20/16 RoNS design is a profound failure and one clearly founded in thinking that should be technical but was twisted by ideological blindness and mode obsession. Whether this failure is entirely to do with political level meddling, and was opposed by NZTA, or instead the motorway-only model was also cheered along by the highway building agency would be interesting to know. Politicians are almost guaranteed to be hopelessly wrong, but the experts ought to be, well, expert, and be committed to doing the best, not the expedient thing. Given it was the most token gesture to bus lanes on SH16, somewhere west of Waterview (more of a breakdown strip than anything and even then intermittent), where is these bus lanes going to fit in? And I wonder if the tunnel flooded in the “tempest”. They are delaying opening for when the SH20 ’emergency widening’ is done; they are terrified it will open to gridlock…. rightly. I’d rather be gridlocked on SH20 than have the drive through suburban Mt Roskill and I think the residents would prefer me gone too. Why is it that the road builders precious egos come before incremental improvements in utility? They always seem to put best ahead of better. Mr Plod. I would say that the obscene amount of money spent on Waterview and the tunnel, almost as a showcase to motorway nirvana and one for the Prime Minister to cut the ribbon on will make motorways look pretty stupid if there are traffic jams early on. And I worry there is more issues than that. Normally these projects are on time and there has been no hurry on this one. So it’s a politician’s ego we are worried about there then? I say open the beast and see what happens, will give them the best test data & traffic modelling they can get. Grant surely they have to…? Could they really keep delaying it till after the election to save their master’s blushes? Isn’t the idea to delay it till after the elections and then immediately blame the new government for the gridlock? Yes, I think it’ll be gridlock too (and even worse gridlock with the East-West thing – making it motorway system-wide gridlock). Waspy; you’ve got the wrong politician there, think Mr RoNS…. Honestly, WTF?! That is a takeover, pure and simple and there’s no bloody way they should be allowed to, any more than they should be allowed to interfere with how cities and regions run their buses. Do they think that the council is blind with stupidity, or are they simply adopting Dr Cullen’s approach of “(Toll NZ) my way or I’ll buy you”? Auckland pay a handsome share toward Aucklands rail network already. That doesn’t answer the question as to why the control freaks in the National Party want to intervene in the operator tendering process! It was not so much central government interference but the lack of other tenders, AT offered yet another one year roll over to Transdev while applying to NZTA for their own rail operators licence. NZTA declined ATs application and as Transdev told them they were not interested in yet another single year roll over AT were forced to offer a longer contract. Do you know why AT were refused a train operators licence? Still a year before the new network in the east ? What’s the delay, we went through consultation 6 months ago. The connections from train at Panmure heading east are a nightmare because the buses from the city don’t stick to timetable. Buses need to start and finish there. Plus AMETI needs to be build now. (and to Light Rail spec, not ‘some stage down the line, judging-by-the-airport-at-least-100-years-away timeframes that don’t actually exist’). For Esmonde Rd, I hope AT review bus stop patronage separately from PnR usage as anecdotally to me, bus stop patronage seems higher. Would be interesting to see the numbers. Why are they wasting money gating Parnell? I thought only high patronage stations are eligible. Question on Parnell. Having now used it it appears to be only a tunnel end exit for the up main platform, no exit at the city end. Or did I miss something? Are there any plans to extend train station shelters? Majority of the stations are very inadequate for the increasing patronage. re western new network, anyone know (because I can’t see any reference to it) if there are plans for more bus priority/lanes for the W4 as it winds through new lynn and avondale then up great north? While I completely get the canning of things like the glen eden express (because it is not very well patronised in my experience), the express buses do have the advantage of skipping both NL and avondale town centres. Of course there’s always the train to avoid those hideous roads, but sometimes it is more convenient to go to or from midtown (roll on CRL and Aotea station!). I don’t think there are any plans for any additional bus priority lanes through Avondale or New Lynn (aside from what is there already). There is a separate bus lane being constructed between Oakley Avenue and the city bound interchange as part of the Waterview Connection. Some mornings are an absolute breeze (like this morning – 30 minutes from stop to stop) but other mornings, buses end up bunching together and take an absolute age to reach Pt Chev when they have a good run past Western Springs, only to then slow down while they reach Grey Lynn. Hopefully there will be big time savings to be had when the bus lane priority measures are finished in Grey Lynn which will remove stops and improve journey times going through that part of the city. It would also be helpful if AT introduced measures to stop commuters paying by cash at that time of the morning as that is a significant hold up as well. I’ve asked AT that explicit question – what bus additional bus lanes will be operational for the new network in West Auckland – the answer was none. Which is a complete disgrace. They (AT) spent already 1.5 years digging up Te Atatu Rd and they’re not even adding a T2/T3 lane there. There is no new interchanges (there were supposed to be two new ones – Te Atatu and Lincoln) either. Basically the new network is a renumbered old one with some slight simplifications to the routes (no real transfers). That means reliability will remain as is – one day 25 minutes the next day the same run takes 60minutes. The only real improvement is the weekend timetable. The Te Atatu and Lincoln interchanges are on a “long term” future West NN. Yes bus lanes make so much difference. Long term is just too long, almost as bad as the government promising rail to the airport in 30 years. I’m a resident of the area. In last 3 years things have deteriorated terribly. The bus that used to take 25 minutes to get to the city now takes 45 minutes (even using that sad excuse for a bus lane on SH16) on a good day. Today my run was 55 minutes. The motorway is already completely blocked at 7am and it can take 15 minutes for the bus to actually travel the 400m of the motorway on-ramp (there is a T2 there, but that’s irrelevant any more – blocked motorway clogs up all lanes on the on-ramps too). There is no bus priority on the arterial (which also get blocked, so the buses are stuck there too). Once there is an incident on the motorway it can take 50 minutes to travel last 1km before the motorway. I have asked AT about the bus lanes further away from the motorway – the answer was – there is not enough buses (currently 8 between 7am and 8am, going to 9 or 10 for the new network, citybound) for a bus lane. The feeling of being locked in is overwhelming and getting worse by the day. And what makes it worse is the knowledge that if the busway and proper bus lanes were there it could be a reliable 25-30min trip every day. Sounds like a nightmare out that way (I take it you are travelling from Te Atatu? ), & I see on Twitter new road markings on motorway didn’t even help this morning? Yeap, from the peninsula side. The new markings are only for the westbound off-ramp. City-bound hasn’t changed in a while. They’ll take a few days of getting used to. One bad thing about them is that in sunstrike or rain you can’t actually tell the old from the new. You could cycle/e-bike along the nw cycleway to three city in less time, and many are doing that. Unfortunately it’s not feasible at this stage for me to bike/e-bike. The total distance is about 17km, so even on an e-bike that’s 40-45mins. If the car now takes 55min, then how can 40-45minutes on an e-bike not be a better alternative? Wow, no wonder NZTA don’t want to open the Waterview tunnels; the traffic lights on the motorway interchange will make things even worse. Maybe they should just paint all 6 tunnel lanes pink and make it a cycleway now, to save themselves from the backlash. The short answer is – no. If you look at the map the most direct route (W2, or 110) still uses Lincoln/Triangle Rd and Great North Rd. That will not be fast. I expect about 45-50 minutes off-peak, about 80 minutes during peak. This is a comparable distance to Albany CBD that on the NEX takes about 35 min at peak. The frequency is a staggering every 30 mins in peak. Looking forward to the Central New Network opening so I can catch a frequent bus down the (admittedly steep) road to either Penrose & Sylvia Park stations. Will also have the choice of a less frequent bus stops nearly outside our door! So much better than the current complicated infrequent looping service with large gaps of time in it at certain times. Here’s hoping the Section 17A review results in ATEED being shut down. They could use the money for something useful instead. Did you remember in 2011, they said that in 2015 there would be a new network in the central suburbs? Have been taking the 380 from the airport sometimes. Is quite well patronised by workers even in the middle of the day, especially between the airport and mangere town centre. Time to upgrade it to a frequent service rather than every 30 mins? it’s 55min by bus, not sure how long it takes to drive at that time. That is what they are doing, AT had planned to gate the station prior to the major reconfiguration due the third main but thankfully they have seen fit to save some of the ratepayers money. Why does the new North network implementation date keep getting pushed out. It was 2017 originally, then early 2018. AT is a CCO. Any failure of AT is a failure of AC. The same as if a worker fails, it’s his/her boss’s fault. If AC isn’t willing to set clear goals, clear deadlines, and then follow up with proper accountability, it only has itself to blame. If I were Phil, I’d basically impose a purchase agreement for specific outputs on AC. Here is what I want; here is what I’m paying; you spend money to achieve these goals and nothing else. If I order catering, I don’t want them using that money for other purposes. I think the idea of CCOs was to not be accountable (both in theory and in practice). Anyway, no wonder AT are running scared with 200% year-on-year growth. No wonder they don’t want to put in any bus lanes; they don’t want to encourage even more growth.